Beautiful card. Love your color combo and design. So glad you got to go to MFT, lucky you. I have been wanting to go to their new location, but haven’t make it yet. Lucky you, Nancy. My husband would have turned around and sped in the opposite direction. Sorry we didn’t see you new purchases in this card but the flowers you used make a lovely bouquet on that striped background. I don’t know why I don’t enter this challenge more when I make so many birthday cards. I’m making it my New Year’s resolution to do so. Please join us Bobby!! I would love it! Thanks so much! I love your gorgeous card and I envy you that trip to the MFT store. I am sure you were overwhelmed at times with wondering what to purchase and what to pass up. But I bet it was a fun trip too! Awesome card design! Fun color combination! I love the pretty cluster of flowers : ) Sounds like a fun trip to MFT! So glad you got to go! It’s about the same distance for me, but I am never travelling at times/days when they are open. Soon, I hope! Lucky lucky you Nancy. Can’t wait to see your ‘new’ goodies here real soon. Love this simple and lovely birthday card. Great layout. Have been hoping the card I made for my husband’s Aunt (turning 90 and we are going to celebrate with a huge party tomorrow) was going to be suitable for STB. Will upload in a few days. Ok, I don’t know where to start..
First, ‘bit’ is understated… sooo jealous!! Wish I could go to some pretty stores and shop too!! Luck you! Double that since you’ve got such a sweet hubby! Third..can’t wait to see how you’ll use all your new goodies!! Well, I think that needs to be my destination vacation!! YESS!! Very jealous, you lucky girl!! and I love your card for this New Year challenge! Great design and color choices! Happy New Year friend! Nancy, love your blue and yellow combination. This is so pretty. Oh my, I didn’t know there was an actual MFT store. How fun is that. Hope you had a great holiday. Happy New Year, my friend. What a great card Nancy, I am a big fan of diagonal stripes, so I adore this card, and loving the combination of blues with yellow. I had fun reading through your post today, you know I would be happy if I had any craft store in my country. I travel to Hong Kong, which is an hour by sea, but also another country to get my craft supplies. Like your hubby, mine is too good, and I really appreciate the fact of him accompanying me everywhere for my craft shopping, and willingly(I hope he is 😉 ) spending . 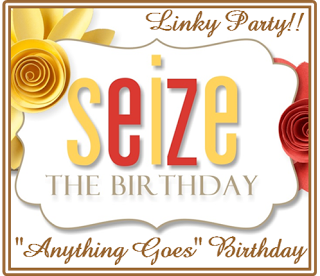 Thank you very much for inviting me to be your Guest at Seize the Birthday, I am super delighted to be part of this. Oh you are a lucky girl to live so close to MFT. But I guess that I ma lucky too, as I only live 40 minutes from Gina K. Lol Had to rub it in. We both have sweet husbands, so we are ever there. Your card is so sweet and I love the design. I’m sure that it is very sparkly in real life. Lovely birthday card with the yellow flower bouquet! 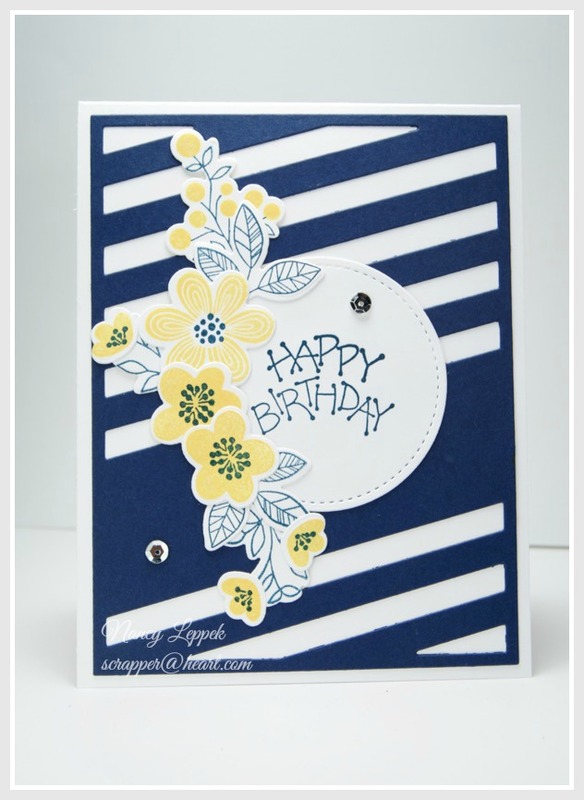 Love your die cut background in navy, too! I bought the same flower stamp on thanksgiving when it was on sale… couln’t help :). BTW you could link up this at The Flower Chllenge. They have the color theme: blue and yellow in this month! Have a great weekend, Nancy! What? 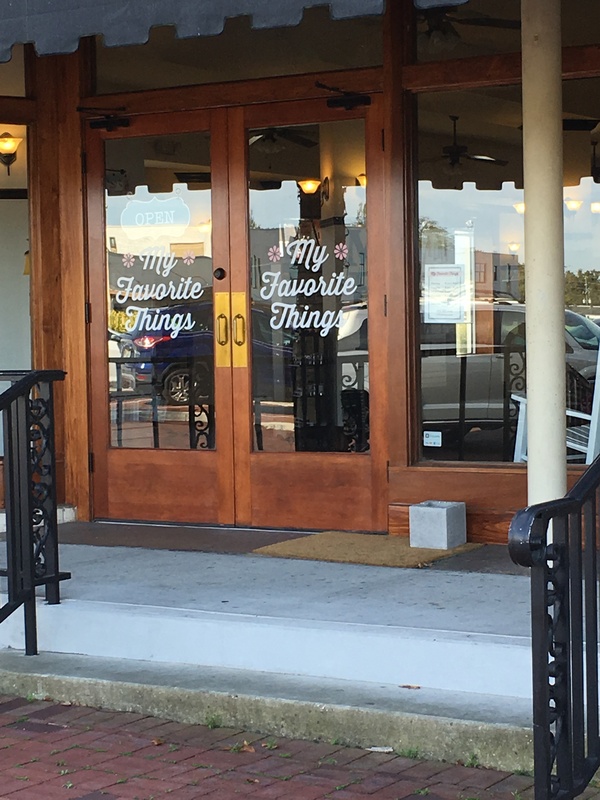 An MFT store in Florida?! Oh that is going right on my to-do list! Such a gorgeous card. I love the colors and your spray of flowers! Happy New Year, Nancy! Terrific card! Love the background and the flowers. Happy New Year my friend.